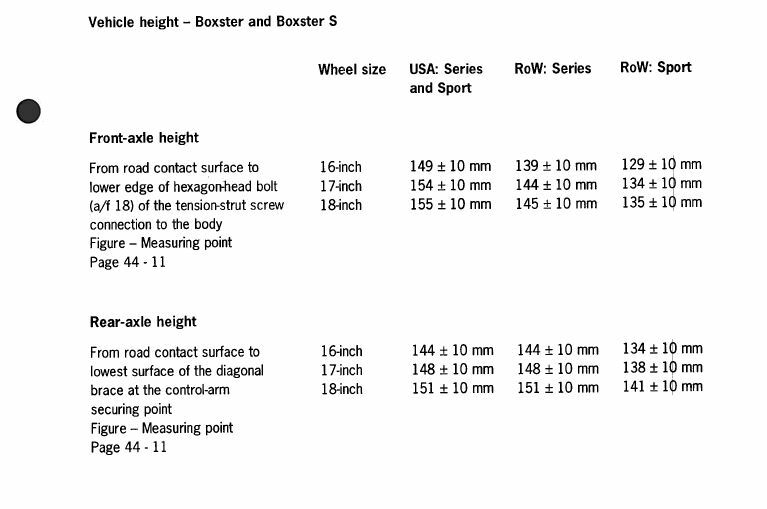 Is the spec Boxster ride height considered the lowest desirable ride height or are some of you running lower setups? Last edited by steved0x; 04-16-2017 at 09:00 AM. ignore the drop links and sway bars, toe arms, and the torsion arms. for camber, the important thing is the lower control arms and the strut. the boxster likes lots of negative camber (negative camber gets you more contact patch when you roll onto the outside side of the car in a turn) and this is achieved in three ways: shortening the strut will draw the top of the wheel carrier inboard and increase negative camber, moving the top of the strut inboard will achieve the same thing. making the lower control arm longer will push the bottom of the wheel carrier out and increase negative camber. hence the products on the market to make it easier to get negative camber - strut top mounts, adjustable lower control arms. so, you set your alignment in a static environment, but realise that driving is dynamic. when you turn, your car rolls onto the outside wheels and compresses the outside suspension. this shortens the strut which increases negative camber and gets you even more tire in contact with the ground when you need it. HOWEVER, realise that when the strut compresses that the lower control arm moves also. it is fixed at it's inboard hardpoint so must travel through an arc when the suspension compresses. if the lower control arm is horizontal to the ground prior to the turn, when the strut compresses the lower control arm will rotate upwards and will actually pull the bottom of the wheel carrier inboard and reduce camber. so, you want your lower control arm not quite at horizontal so that when the strut compresses it moves to horizontal and not past, increasing rather than decreasing your negative camber. of course, lower control arm orientation is determined by ride height, hence why racers don't slam their cars. the ones that are super low have reocated suspension hardpoints. i've had my car at stock, super slammed, and am now at m030 which is where it will stay. 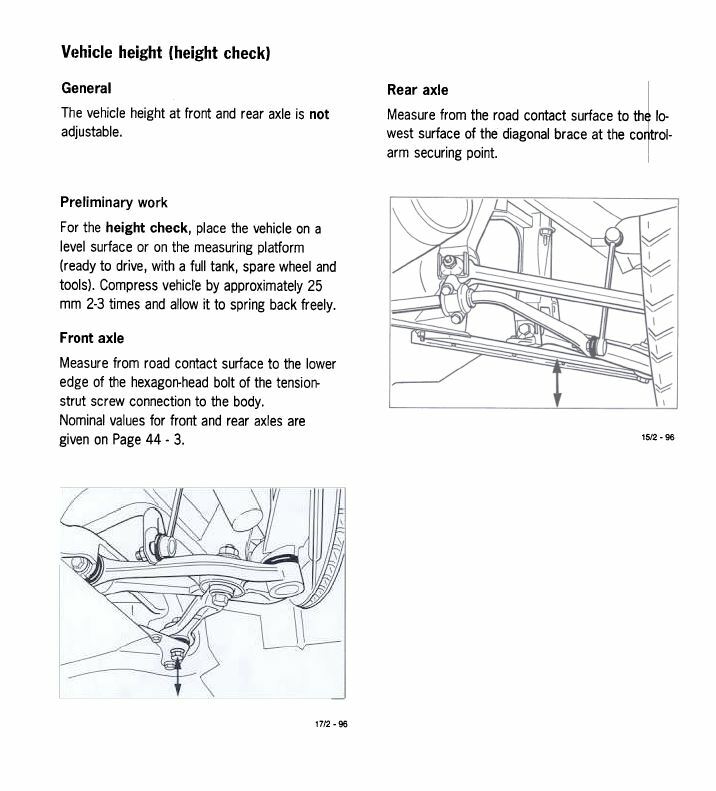 the actual m030 heights are in the shop manuals, and steve has posted them on the site before. sometimes refered to as clubsport height depending on the reference. Last edited by The Radium King; 04-16-2017 at 07:56 AM. My Spec Boxster is not set at the lowest ride height allowed by the rules. At the lowest height, the shocks will occasionally hit the bump stops and there is a lack of suspension travel which reduced grip. I also run a bit of rake (front slightly lower than rear). Yes, there is a cost to the higher ride height in terms of increased aero and weight transfer but these costs are less than the benefit from greater suspension grip. For others who might read this, remember that Spec Boxster's have PSS9 coil-over shocks so the ride height is fully adjustable (which is not true of the stock suspension). Ride height minimum 90 mm front and rear as measured at front cross of aluminum cross member and front-to-rear braces near rear sway bar.